The company's FANWALL® system is an array of small fans designed to replace centrifugal or vaneaxial fans where space is limited. Utilizing an array of fans enables better optimization of the fan-wheel geometry and motor horsepower, according to the company. 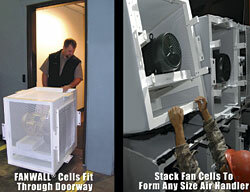 Replacement fans fit through standard doorways.